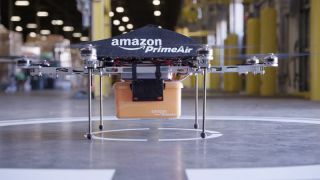 You won't even need to go to your door to receive a package if Amazon's plans for drone deliveries come to fruition. The online retail giant's patents for parcel delivery by UAV have just been published by the US patent office, yielding a few new details on how the system will operate. Drones will use data from your smartphone to work out your exact location and take your parcel right there. Different drones will also be able to communicate between each other to discuss traffic and weather conditions. If you don't want the package brought straight to you, that's an option. You can tell the drone you'd rather have it dropped off at your home, workplace, or even "my boat". If you change your mind halfway through delivery, there shouldn't be a problem - the drones can update their routes in real-time. While progress has been slow, due to the US Federal Aviation Authority's reticence to approve commercial use of drone technology, there are signs that it's softening. Amazon was granted permission to test-fly its drones in the US in March, albeit within the pilot's line of site and no higher than 122 metres. Plus, this week, the agency permitted unmanned helicopters to be used for crop-spraying, and announced plans for news-gathering drones in partnership with CNN. It is also planning to test commercial drones that can fly beyond the line of sight of their operators for inspecting railways.